Here you can find a strain description about Sour Lemon Haze and also some user-based reviews and infos directly from the SeedFinder (if available). 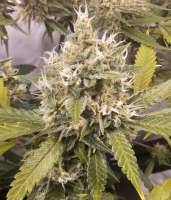 You can also find the offers and auctions here if Sour Lemon Haze cannabis seeds are on stock at MyCannapot right now. Sour Lemon Haze is our regular version of the legendary Super Lemon Haze. Sour Lemon Haze is a cross between our Super Lemon Haze and our popular Pineapple Gold male. The Super Lemon Haze used has a THC content of ~25% and a high proportion of CBN. After 9 weeks harvested, the flowers get a nice golden yellow color after curing and the citrus-haze aroma then comes into effect. The flowers are then full, the calyxes are large and swollen, the resin is enormous and the trichomes are amber. The effect is very strong and more a bodyhigh but nevertheless stimulating. Our Pineapple Gold provides a much more pronounced and sour fruit-flavor and a more stimulating effect. The vitality is improved, the flowers become longer and bigger and the yield increases to 1.5gpw. The Sour Lemon Haze flavor is distinctive: sweet-sour, lemon-lime-orange mixed with incense, sandalwood and green pepper. Very intense and simply unforgettable good. The effect is stimulating, very strong and narcotic when consumed intensively. An excellent medical choice for nerve pain but also a wonderful stimulus for creativity and conviviality. The plants should grow at least 2 weeks before flowering is initiated, thus improving yield, taste and potency enormously. It is, however, also possible to start directly in the flowering rhythm, only then the flowering period is extended by approximately 10 days. Sour Lemon Haze is an F1 crossbreed as it should be, the plants are resistant to pests and tolerate much fertilizer. It is easy to find a perfect phenotype that is suitable as mother plant and provides vital cuttings for many years. This variety is medically particularly good for pain and depression, a very strong variety with which the consumer should be careful, even if it is so delicious and smells good. Not difficult to grow and highly recommended for everybody who needs strong, medicinal cannabis. One of our top 3 favorite varieties! Have fun with our Sour Lemon Haze, your Cannabella Team. Initiation of flowering onto around 26 cm. - Final Height onto around 82 cm. oldgolden a true winner! real lemon haze flavor, love this strain! grows good, plants are strong, yield is solid, quality is supreme! friends keep asking me for the lemon haze! strong lemon and incense taste, real strong high, hits like good old amnesia! Orangetree All had a lemon flavor and where very resinous there are only little differences. Some more sweet, some more sour, there was even a Amnesia tasting plant and a lemon bubblegum one. Flowering was about 9 weeks. The plants where uniform just two of 16 girls where a little bigger. The yield was very good, a good cashcrop because of the lemon haze taste that was dominating. Buy Sour Lemon Haze now at MyCannapot!